These additional sprays started out as custom blends made for individual clients that have had a more universal application and have therefore been added to the collection. More are on their way! Angel’s Song is my best seller. This was created for a child in crisis. Use it whenever life seems overwhelming. It will soften the energy around you and create the feeling that you are being taken care of. Opalescence, originally created for a spirited artist who was seeking a spray to inspire her. This became a favorite for people who want creativity and joy in their lives. 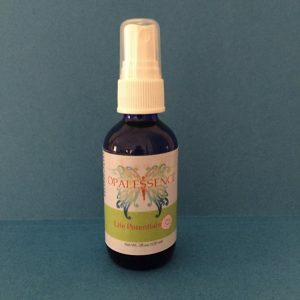 There is a bit of magical, sparkly fairy energy as well adding to the whimsical nature of this much loved spray.